The buildings where newspapers were published in the 20th century were often iconic structures. They stood out on the skylines of large cities or became gathering places for local residents in small communities. 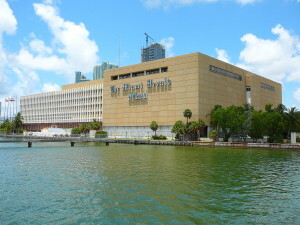 Perhaps none was more symbolic of the community it called home than Florida’s flagship Miami Herald building that looked out on Biscayne Bay. Built in 1963, it also served as headquarters for the Knight Ridder chain until the late 1990s. Like many other newspaper owners in recent years, the publisher, McClatchy, decided in 2013 to move from downtown, and seek smaller and less expensive quarters in the suburbs. 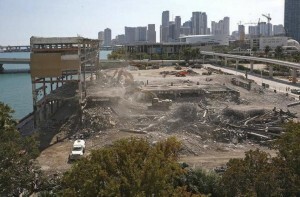 In this article, professor Nikki Usher chronicles the effect that the move had on both the Herald journalists and on the Miami community. “Where news is made matters,” she concludes. As a post-script, the old Herald building was purchased by a Malaysian company and demolished in 2015. Nikki Usher is an assistant professor at George Washington University's School of Media and Public Affairs. She is the author of Making News at The New York Times (University of Michigan Press, 2014) and Interactive Journalism: Hackers, Data, and News (University of Illinois Press, November 2016), which looks at the rise of programming, data, and hacking in journalism and the ensuing changes to the profession. She received her PhD and Master’s degrees from the University of Southern California’s Annenberg School of Communication and her A.B. from Harvard University. Click here to download the article, which appeared in the journal, Media, Culture and Society, in 2015. In 2012, I found out that my old newspaper, The Philadelphia Inquirer, was moving out of its 18-story home, a white skyscraper with a clock-tower on top, and into cramped quarters in a former department store. My friend at the paper posted a picture from the very last day in the newsroom, and I got really misty-eyed. But it also caused me to question what was happening elsewhere, why, and what was being done to look toward the future. I pursued funding from the Tow Center for Digital Journalism at Columbia University and did a study of four metropolitan newspapers that had moved or were moving into new offices. I looked at how their plans for their new built environment, all of which included centralized news hubs, impacted the speed of news, the journalists working at the newspaper, and the community at larger. The larger project can also be found here. The scholarship I looked at came from two places: historical studies that argued newspaper buildings were communicative architecture that symbolized the power of the press and more contemporary studies about how spatial configurations of newsrooms impacted news production. Aurora Wallace at NYU has been a real inspiration for my work from the historical perspective. The more contemporary literature came from studies of online and print convergence and research on mobile news and tended to focus on different cultures of journalists coming together in shared spaces. I spent time looking at some of the organizational communication literature about floor plans and office space. Since I was looking at how the built environment impacted the social construction of knowledge and conceptions of professional identity, I also considered theoretical literature in spatial geography, which argues that place, space, and time are intimately related to culture meaning. Places matter to how journalists do their work. Where journalists do their work - the physical location plant - actually makes a difference in how they cover news and how they see themselves in relation to their community. Space matters to how journalists do their work. The built environment can be deliberately arranged to create different communication flows. And even in a digital age, physical architecture still matters when influencing how people work and ultimately relate to each other. In fact, physical proximity enables digital speed. The built environment - news buildings, physical designs of news hubs, actual material items in a newsroom, etc. - are deeply symbolic to journalists and to the community. Journalism is perhaps no longer industrial, but still remains deeply rooted in its industrial past, tied to a legacy of big machines, unions, and massive physical distribution efforts. More than anything else, where news is made matters. And when the place where news is made changes, we need to think about the implications on journalists, news coverage, and a news organization's standing in a community. This reconfiguration of space is happening across the newspaper industry, and we need to understand its impact. I recently returned from Omaha, where I was continuing to investigate the dynamics of physical objects, their digital instantiations, and the workflow of journalists. Next up is a book, under contract, from Columbia University Press, that explores those themes.